Yes, this is what it has come down to. I have such little faith in peoples' attention span that I have to offer the giveaway in the title. But that slight wasn't meant for you. No, you care enough to read all the way to the end.Good reader. Poll any local brewery's beertenders and ask what the main thing people call about is and they will likely say it's people wondering, "What food truck will be there today?" That or, "Uh, yeah, are you guys hiring?" Because nothing shows initiative like sitting at home and calling a business rather than actually showing up and filling out an application. 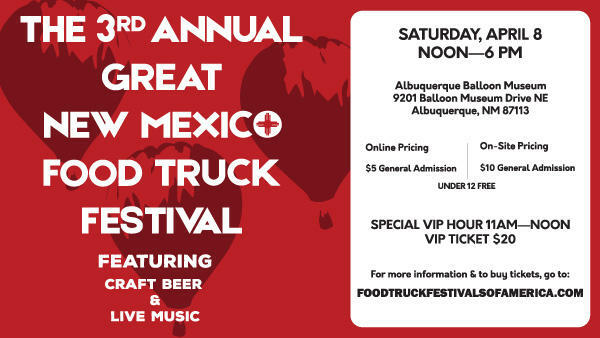 Food trucks have become a huge part of the experience of visiting Albuquerque breweries, both to my delight and dismay. Dismay because I saw a need for a food truck (at least parked outside downtown bars) back in 2006; even wrote a business plan for it but never followed up on the idea. And look at the phenomenon it has become: trucks outside every brewery that doesn't have its own kitchen, and even a food truck meets craft beer festival. There a quite a few standout beers on that list, and it's a reflection of how times have changed. I remember seeing Pure Hoppiness listed as being on tap at Toronado San Diego a few years ago and the bartender said he had put the sign up but the beer wasn't being tapped till the next day. When I told him we were flying home the next day, he went and tapped the keg for us. That was such a big deal then, but now we can drink it in a park in Albuquerque...thanks, Obama. I thought I knew most of the food trucks in town, but many of these are new to me. I can vouch for Street Food Institute (which employs CNM culinary students). Nomad's BBQ "truck" resembles something you'd see when you're getting your roof tarred but the BBQ is excellent. My Sweet Basil decorates the exterior of their truck like a Williams Sonoma store and may be the closest to gourmet that you get on wheels. O'Bean's Coffee Cruiser is an East Mountain-based mobile coffee shop run out of an actual 1971 Volkswagen van. Whoa, is this coffee laced with something? I think I'm trippin'...no, wait- those are just East Mountain people I'm seeing.